This shrub grows mainly in the Mediterranean region and was known as Holy or Sacred herb in ancient times. Hyssop, due to its disinfectant and anti microbial properties, found its place even in the Old Testament as a purifier. 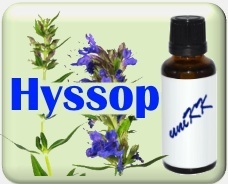 Hyssop oil blends particularly well with Clary sage, Geranium, Orange, Melissa and Rosemary. ​The name Hyssopus was used by Hippocrates and was derived from the Hebrew word 'ezob' which means 'holy herb'. It is mentioned in the Old Testament, where the herb was used for purification.This shrub decorates the Mediterranean area, is about 60 cm high and attracts bees. ​Hyssop oil is non-irritant and non-sensitizing but should be avoided by people with epilepsy, children, fever or during pregnancy, since this contains a compound which can stimulate nerves. This oil has good healing properties and helps with bruises as well. Also useful for the menstrual cycle. When vaporized, hyssop oil can help with anxiety, mental fatigue, coughs, bronchitis, asthma, colds and infections. Hyssop oil ranges in color from colorless to pale yellowy-green, and has a sweet, warm smell andThe therapeutic properties of hyssop oil are for respiratory and digestive complaints, and externally for rheumatism, bruises, sores, earache and toothache. It has also been used to regulate blood pressure and as a general nerve tonic relieving states of anxiety or hysteria.